#1 - Colleagues: Inviting your boss and work friends is completely acceptable at a local wedding. But, they should not be included in your destination wedding. Even though you’ve become quite close spending 40+ hours a week together, if they aren’t your best friends and you don’t have a close relationship outside of work, they shouldn’t be invited. #2 - Your Parent’s Friends: If you don’t have a relationship with your parent’s friends, it’s best to invite them to the celebration when you get home and not the wedding itself. Even if your parents are contributing financially, you’ll want your guests to be an intimate group of people that have supported you through the years. #3 - Children: With a week of adventures, dinners, celebrations and the occasional one too many glasses of champagne, destination weddings aren’t the best for small children. Invite friends and family to leave their kids at home and take some time to relax and celebrate with you. #4 - Extended Family: The definition of extended family can vary for everyone depending on the size of your family and how close you are to them. We say limit it to parents, siblings, and grandparents only including aunts, uncles and cousins if you’re close and see or speak to each other on a regular basis. 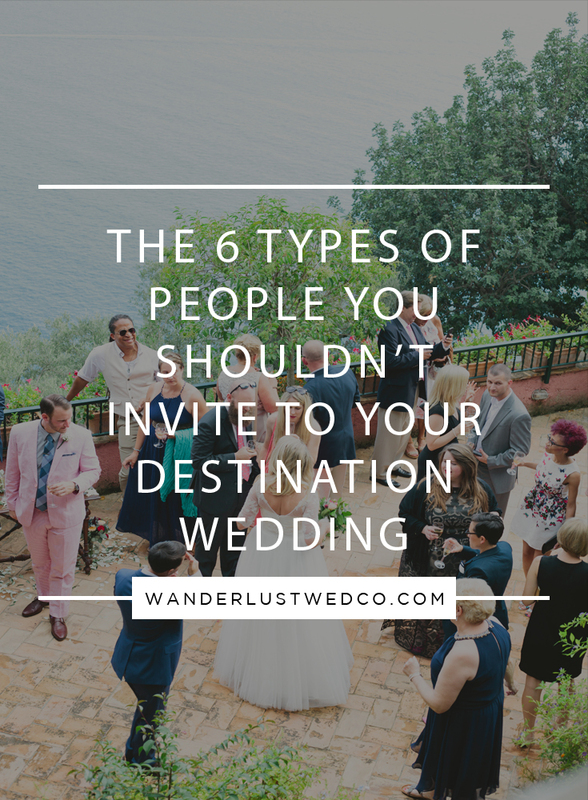 Destination weddings are not the time for a family reunion. #5 - Your college buddies you haven’t seen in ages: Just like it’s not the time for a family reunion, it’s also not the time for a class reunion. While you may have been close at some point in your life, if you don’t see or talk to them at least a couple times a month, invite them to the at home reception only. #6 - Unsupportive Friends: You know who we’re talking about. Even if you see or talk to this person on a regular basis, any friend that constantly complains or belittles your relationship, decisions and choices should stay home. Traveling can bring out the worst in people, especially those that are already prone to complaints, and you don’t need that kind of negative energy during this happy time.